After reading “The Automatic Millionaire” I changed my 401(k) contribution from 10% to 25%. I own an apartment and make extra payments every month. I work and live in New York City and am 25 years old so I know how tempting it is to use plastic. 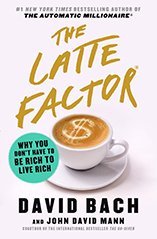 There are sooo many Latte Factor temptations (Starbucks,cabs) in this city so it is tempting to stray from the plan but knowing that it’s all automatic and I am on my way to FINISHING RICH makes it all worth it. Making it AUTOMATIC should not be a choice!! !